This morning, we crawled out of our warm beds and dressed in warm clothes. We chose things that were pink, had inspiring messages, or were rainbow. E's shirt, a pink one, proclaimed across the chest - "Though she be but little, she is fierce!" She wore a rainbow skirt and a pink jacket and waved a Pride flag she chose from a locally owned bookshop on Fourth Avenue. T wore a "Vote ME for President!" shirt, I wore a rainbow scarf I crocheted a few years back, and C wore rainbow leg warmers. We ate breakfast and piled into the car. We parked on campus and met T's parents. Together with several others, we boarded the streetcar bound for downtown. We didn't realize how fortunate it was at the moment, but we boarded at the end of the line and just stayed on - the very next stop was jammed up with people wishing to board at the first stop. 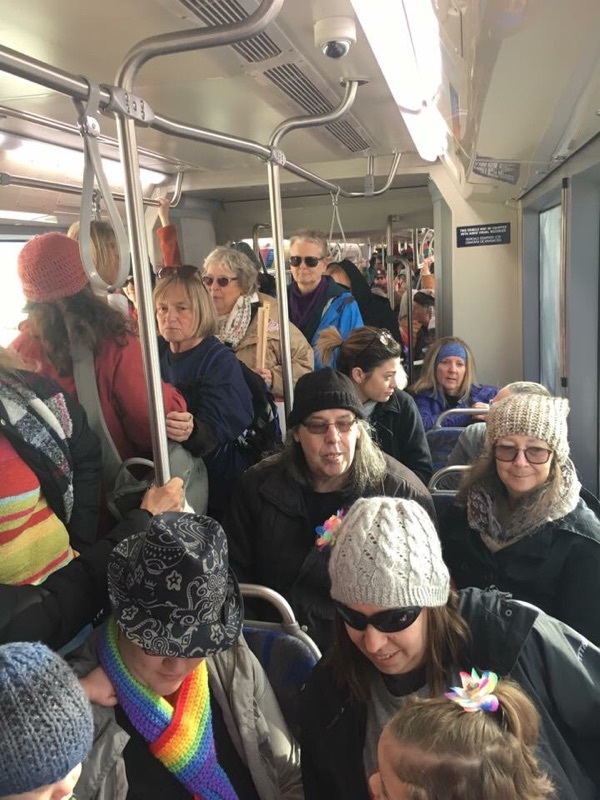 Our streetcar could only accommodate a small portion of the crowd waiting at the stop and none of the people at any stop after that. Stop after stop, we rode past crowds of energetic marchers waving signs. The wheels of the streetcar groaned and ground against the metal tracks laid into the concrete, car full to bursting with the weight of our collective hope. I looked around. I marveled at all these people and wondered what the day had in store for us. Women standing close to us chatted with E and played peekaboo with C. The kids smiled and laughed and charmed everyone. While sitting there, I received a text from one of my friends in Texas. It was a photo of my family, sitting in the streetcar! One of the women who boarded first was standing directly in front of us; she had taken a photo of the packed streetcar and posted it to Facebook. Turns out, she's friends with my friend J, who currently lives in Texas but is from here. Our lovely city is a fair size, but at times like these, it seems downright tiny! We all laughed and were jubilant. Once downtown, we filed out of the streetcar and streamed towards the park where everyone was to meet. It began to rain. The sky was full of bright, full, white clouds and the sun shone as the rain came down. Undeterred, marchers gathered in groups. Signs were wrapped in plastic, taped with packing tape, or started to curl due to the rain. Women, men, children, dogs. All of us together. C had fallen asleep in the carrier on my back, so I stood in one place and swayed back and forth to keep him asleep. I looked at all the faces around me and thought, My family isn't alone. All the people there at the march felt strongly about women's rights. About people of color. About LGBT people. About fighting bigotry, hatred, racism, misogyny. 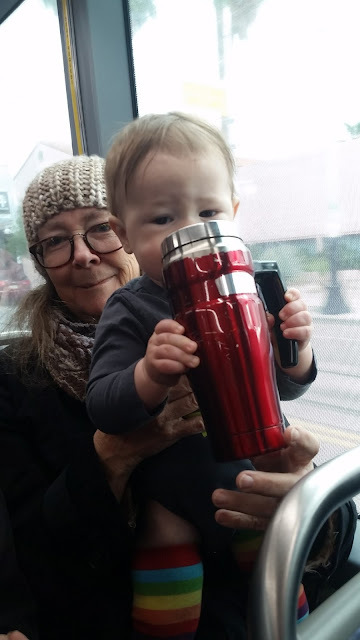 When my family walked to the streetcar stop earlier that morning, the people there looked at us and smiled. They saw E with her Pride flag, me with my rainbow scarf, C with his rainbow leggings. They saw two small children with two mothers. It was the most "out" we've been in a long time, as we don't typically go out of our way to identify ourselves to strangers as a lesbian-headed family. It's simply too scary to do that. My anxiety level climbed, knowing we were about to go into a very visible liberal event labeled as gay. But when we stepped into the midst of the other marchers, I felt a safety that I've rarely encountered. Suddenly, I knew that if someone wanted to harass us, there were thousands of people around who would step forward and say, "THIS ISN'T RIGHT!" Who would help me protect my family. And a warm flame burned inside my chest, knowing that other people in the crowd recognized that I would do the same for them and their families. Finally, the actual march got started. It took a long time to get all the marchers funneled into the street, so we moved slowly. E was losing her patience, but her grandfather had a great idea. He lifted her up onto his shoulders just in time for a cheer to go up among the marchers as the first ones hit the street. Signs and fists were thrust into the air all around us as a cry of joy left many lips. Grandpa turned for a moment to check that we were all still together, and I caught the look on my 4 year old daughter's face. Her face was alight with joy and awe. It would have been impossible to be in that crowd and not feel swept up in the exuberance of the moment, plus, E had the best view of anyone. Proudly sitting atop her (tall) grandfather's shoulders, she got to see the march stretch out before her, as far as her eyes could see. While I watched her, E turned and looked straight into my eyes. I am so full of love and pride in this little girl. I hope she remembers this. She is one of the biggest reasons why we marched - her, and every other little girl out there who has hopes and dreams. She deserves a fair shot, given on equal footing. She deserves a world in which men don't think they are entitled to her body or her mind, one in which she's in charge of herself and nobody gets to decide anything for her. This is for you, daughter. And for you, son of mine. May you grow into adults in a world of equality, hearts full of love and minds full of the knowledge that your parents adored you and fought for you and wanted you to be happy.